Hard Farm Barns01328 830655work Self-cateringHard Farm has three beautiful 4* Gold Award winning Barns sleeping two with stunning beams in a peaceful rural location. They offer twin or super-king sized beds with all linen and towels provided. Full central heating keeps them warm even in the coldest winter. Oak is all on one level making it suitable for less-abled guests. Beech has a Jacuzzi bath and Ash welcomes a well-behaved pet. The area offers wonderful bird watching with Spring Watch's Pensthorpe only 10 minutes drive away, beautiful countryside for walking and famous sandy beaches at Holkham and Wells. Blakeney and Wells are a few minutes’ drive north and the lovely Georgian town of Holt is 5 miles to the east. We have National Trust properties at Blickling and Felbrigg and the beautiful Rhododendron and Azalea walks at Sheringham Park. There are also fantastic Stately Homes at Houghton and Holkham which are open to the public. 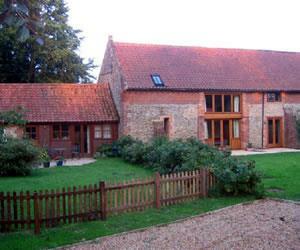 Hard Farm Barns offers weekly bookings starting on Friday. One bedroom, double or twin. Ash offers weekly bookings starting on Friday. Hard Farm has three beautiful 4* Gold Award winning Barns sleeping two with stunning beams in a peaceful rural location. They offer twin or super-king sized beds with all linen and towels provided. Full central heating keeps them warm even in the coldest winter. Oak is all on one level making it suitable for less-abled guests. Beech has a Jacuzzi bath and Ash welcomes a well-behaved pet. Personally supervised, fresh flowers and a warm welcome. Take the A148 from Fakenham. After 5 miles turn left through Bale to Field Dalling. Turn left towards Binham. Little Marsh Lane is 200 yards on the left. Hard Farm is 0.25 mile up the lane on the left hand side. Beech and Ash both have stairs so are not easily accessible.